Amy Mergen is a big-picture, around for the long-haul, never give up girl. Amy has been with FIS for 23 years, she is the chief of staff to the president and CEO, which involves a lot of project management, a skill she made use of during her cancer treatment. 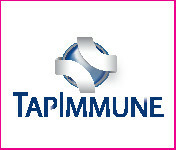 TapImmune, Inc. (NASDAQ: TPIV), a clinical- stage immuno-oncology company specializing in the development of innovative peptide and gene-based immunotherapeutics and vaccines for the treatment of cancer and metastatic disease today announced the opening of its Phase 2 company-sponsored ovarian cancer study in platinum-sensitive ovarian cancer patients. She’s traveled the world and become one of the nation’s most successful travel agents, but Mara Hargarther considers a three-mile stretch in downtown Jacksonville, Florida her most memorable journey, as she is a breast cancer survivor. The New York native worked on Wall Street as a financial executive until she married Tom and left to have her three children: Brooke (27) and twin sons Corey and Casey (26). Hawaiin, Louel Larkin knows everyone thinks of Hawaii and Hawaiians as healthy, fruit-eating beach goers living in paradise, but Louel was diagnosed with breast cancer in May 2001. She is speaking up, because she wants women to be careful of hormone therapy. Closer to the Finish! DONNA partner TapImmune announced that its common stock has been approved to begin trading on The Nasdaq Capital Market. The company’s common stock will begin trading under the symbol “TPIV” at the opening of trading on Tuesday, November 8, 2016. Closer to the Finish! DONNA partner TapImmune announces the commercialization pathway for its HER2neu Vaccine and the initiation of company-sponsored Phase 2 Clinical Trials that will start early 2017. In a Phase I clinical trial on the four Class II antigens in HER2neu breast cancer patients performed at the Mayo Clinic. In whatever way you choose to #BeTheFINISH, your efforts are making a difference. 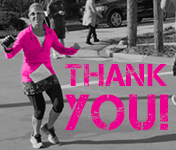 All proceeds of DONNA Marathon Weekend support The DONNA Foundation for breast cancer research and care. So where does it all go? 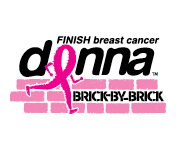 Pave the way to Finish Breast Cancer, brick by brick. Announcing your opportunity to etch your name into history in Oceanfront Park in Jacksonville Beach by purchasing a commemorative brick. Leave your legacy, and celebrate those impacted by breast cancer with your own personalized brick. Closer to the Finish! 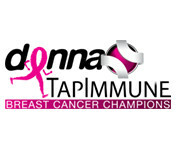 DONNA partner TapImmune issued an update to shareholders September 6 announcing the commencement of enrollment of patients in Q4 2016 for the Phase 2 study of TPIV 200 in the treatment of triple negative breast cancer. WHAT DOES THIS MAN KNOW ABOUT BREAST CANCER? Patty Naugle, contributes “Lefty” as an encouragement to others. In 2006 during a routine mammogram, Patty was diagnosed with DCIS. She elected to have a lumpectomy. During her postoperative checkup another spot was found, so she immediately had a 2nd lumpectomy, followed by 6 weeks of radiation. 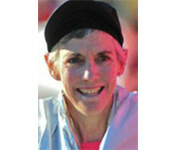 Very quickly she got involved with 26.2 with DONNA, running the first half marathon and volunteering in 2008. She now looks forward to celebrating 10 years with 26.2 in 2017. DONNA partner TapImmune announced its plans to enter into definitive agreements to raise aggregate gross proceeds of approximately $8.5 million from an approximately $2.5 million private placement transaction with new investors and the exercise of certain outstanding warrants from existing investors that will result in gross proceeds of $6 million. 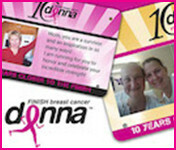 The DONNA Foundation has a bold vision to finish breast cancer. To achieve this vision, it will take support from everyone. Runners, volunteers, donors and sponsors. Individuals and companies – large and small. 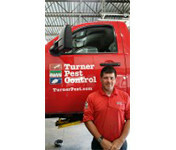 We are excited to welcome Turner Pest Control as a sponsor of our upcoming THE PLAYERS DONNA 5K, and share their story and that of their employee and long time DONNA volunteer Patrick Sheehan. I wish I could bottle it, this feeling I have right now. One of our runners wrote this morning to say she still hasn’t stopped smiling. I haven’t either. The love, support, and enthusiasm that this community shared with runners from all over the world Valentine’s weekend was nothing short of astounding. DONNA partner TapImmune announced a major milestone of dosing its first patient in a Phase 2 trial for triple negative breast cancer with its cancer vaccine TPIV 200. The randomized, open label Phase 2 study is expected to enroll a total of 80 subjects. Go Team Go!